1916 Centenary preparations have gathered momentum at national and local level. For County Monaghan, and North Monaghan in particular, one of the most interesting stories is that of Glasgow-born Margaret Skinnider who, as a member of Cumann na mBan and the Irish Citizen Army, fought in St. Stephen’s Green, under the command of Michael Mallin, and was seriously wounded in combat. By August 1916 Margaret Skinnider and Nora Connolly, daughter of executed leader James Connolly, were in America fundraising for the Irish Volunteer Dependents’ Fund. While there Margaret wrote and published her autobiography “Doing My Bit for Ireland.” In the book Margaret alludes to her North Monaghan connections. 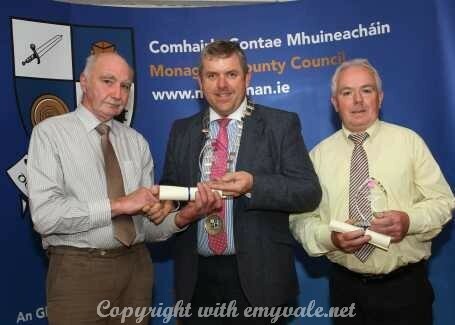 Exhaustive research by Patsy Brady (Cornagilta) and Pat McKenna (Dernasell East) has established her paternal roots in Cornagilta (Tydavnet parish) and both men were recently honoured at an Awards Night hosted by Monaghan County Council for their work. In 2011 TG4 presented a four-part series, Réabhlóid, on the EasterRising. One of the presentations focused on the participation of Margaret Skinnider. More recently the Margaret Skinnider Appreciation Society (MSAS) has been established and initiated a number of projects for 2016 and beyond. 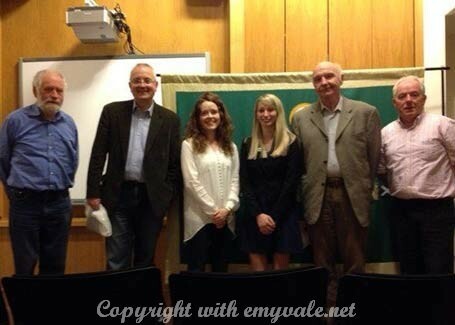 In July society members, Anthony Watterson, Patsy Brady and Pat McKenna, travelled to Scotland and attended a number of functions which included a lecture entitled “Schoolteacher, Suffragette and Sniper: Margaret Skinnider and 1916” by Kirsty Lusk, Ph.D., Chairperson of 1916 Centenary Committee (Scotland). The week-end trip to Glasgow included a visit to St Kentigern’s Cemetery(guided by Stephen Coyle), where a stone, with a simple cross engraved by Pat McKenna, from the home of Margaret’s grandmother, Isabelle Skinnader-nee Kelly, was placed on the family grave. The fruits of the Monaghan and Glasgow collaboration will become more manifest in the months and years ahead. At present Maggie Chetty, former director of the West of Scotland Racial and Equality Council has written a play on Margaret Skinnider which, hopefully, will be presented in Monaghan and Dublin. A Sligo-based writer is also working on a play focusing on the intertwined lives of Margaret Skinnider and Nora Connolly. RTE will feature an extended programme on seven women of the 1916 Rising which will highlight the role of Margaret. A number of projects are in the pipeline locally and these include a booklet/book which will elaborate on Margaret Skinnider’s autobiography and much more. The Skinnader surname is almost exclusively linked in North Monaghan to the parishes of Errigal-Truagh and Donagh and, indeed, research has shown that many of the relatives of Margaret Skinnider still reside in those, and neighbouring, parishes. The committee of MSAS under the chairmanship of Ms Josephine O’Hagan were pleased with the visit of Heather Humphreys, Minister for Arts, Heritage and The Gaeltacht, and County Councillor Ciara McPhillips, to the Heritage Stand at Tydavnet Parish Show in August. Their obvious interest, and the interest at local level, augurs well for the success of a number of MSAS projects in the pipeline. 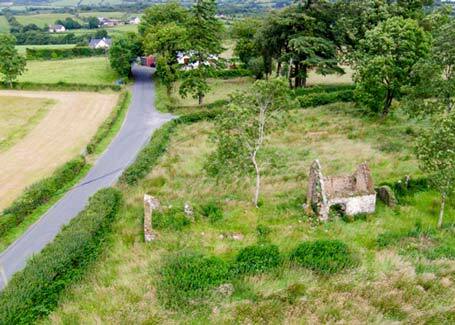 MSAS is registered with the Monaghan Heritage Network and society members are available as guides to those, from home or abroad seeking a guided tour of the Margaret Skinnider countryside in County Monaghan. Work on this aspect of the project, by Secretary Ms Angela O’Hagan, is at an advanced stage. Honorary President of MSAS, former teacher and INTO activist Nora McCinna, is particularly interested in the Margaret Skinnider dimension of the 1916 Centenary celebrations as Margaret was, in the nineteen-fifties, an executive member of INTO and was elected President of the organisation at the 1956 INTO Congress. Retired teacher Mary McQuaid (nee Skinnader), from Ballinman, Glaslough, clearly recalls the obvious delight of Ms Skinnider when they met at that congress. Margaret Skinnider had seen Mary’s name in the INTO membership register at head-office. Nora McCinna was introduced to Margaret (then retired) at the 1966 congress held in Bundoran, County Donegal, where Ms Skinnider, as a special guest, received a standing ovation for her role in the 1916 Rising. Front Row L to R: Anthony Watterson, Angela O'Hagan, Josephine O'Hagan, Patsy Brady. Back Row L to R: Pat McKenna, Mackie Rooney, Paul Moyna, Eugene McCague. 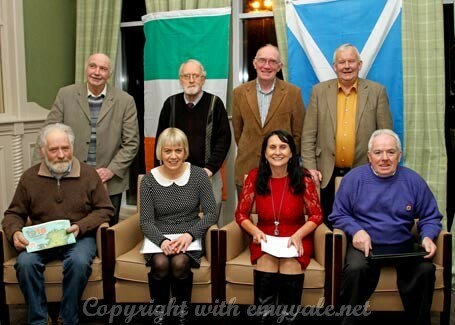 Missing from photo: Nora Ní Cinna, Hon Pres. ; Mary Rafferty, Assist Sec, and Laurence McKenna, Joint Treasurer. 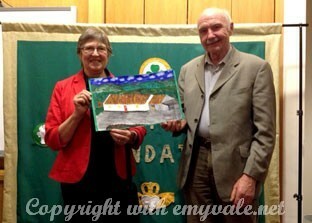 Pat McKenna presents Maggie Chetty with a hand painted image of Margaret Skinniders ancestral home. The image was painted by Rachael McKenna, Feebaghbane, Scotstown. Patsy Brady presents Stephen Coyle with a copy of the Sean McElwain C.D. "Our dear dark mountain, with a sky over it". Pat McKenna presents a copy of "Townlands of Tydavnet Parish" to Kirsty Lusk. 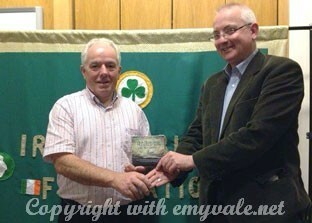 The County Council Award being presented by Padraig McNally. Chairman, to Pat McKenna and Patsy Brady. 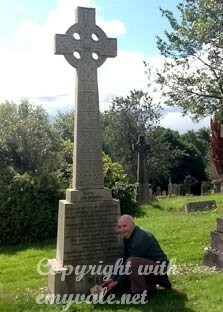 Pat McKenna places a hand crafted stone cross on the Skinnider family plot, Glasgow. Click HERE for Fergan O'Sullivan's visit.